Many dog owners think weight gain in dogs is inevitable, but it is actually extremely preventable. 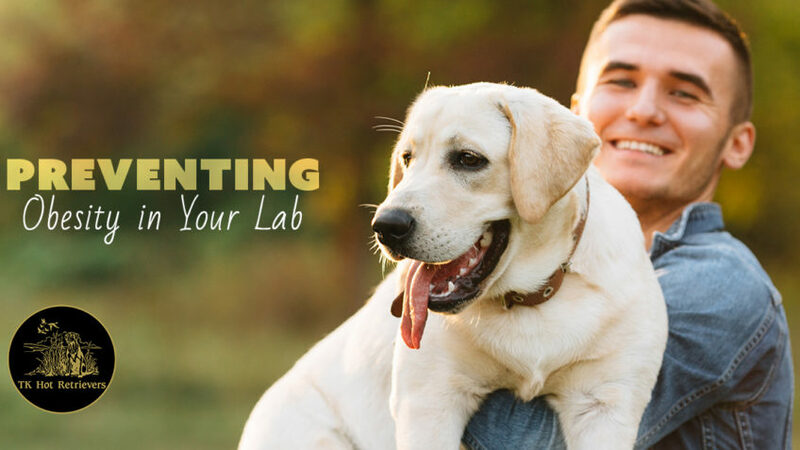 As your Lab’s protector and best companion, you should do everything in your power to keep them healthy and at the appropriate weight for their size. Here are some tips for keeping your pup slim, trim, and healthy! The first rule of thumb is to know a healthy weight for your dog and try to stick around that weight. Healthy Labs usually weigh between 55 and 80 pounds. Male labs may weigh 5-10 pounds more than females, and this is totally normal! Your dog’s healthy weight also depends on their unique build — small or large, stocky or lean, tall or short — so ask your vet what your expectations should be for your doggo’s weight. Treats are good for an occasional reward for good behavior, but many owners go overboard with the amount of treats they feed their Labs. Ration out your treats and try getting treats that are specifically designed for dogs trying to lose weight. You can also try giving your dog veggies or rice cakes as rewards instead of treats that are higher in calories! As all Lab owners know, Labs love to eat! They’re also so cute that it can be extremely difficult to resist their begging. However, overfeeding your dog is a surefire way for them to put on the pounds. If you’re less open to changing your dog’s entire diet, reducing portion sizes is simpler for you and will likely meet less resistance from your dog than a completely new diet. Talk with your vet about how much to reduce your dog’s diet, but cutting 15-20% of food from their diet will likely be sufficient. Protein is perfect to keep your Lab’s metabolism and energy levels high so they can stay more active! High-protein food is also more tasty for your dog in general, so they may even like it better. When you do switch dog foods, though, do it gradually! Start with about 1/4 new food and 3/4 old food, then gradually transition your dog to meals consisting entirely of the new food. If your dog absolutely refuses to eat their new food, ask your vet for their advice. You should be taking your dog out on daily walks as-is, but taking a few extra minutes to play fetch or let them loose in the yard could make a huge difference in your dog’s health. Once your dog reaches adult age, you can take them out on runs with you as well! Use precaution with younger dogs, as their joints and bones are still developing. Obesity can lead to much worse health problems, like diabetes or high blood pressure, so use these preventative measures to help avoid more health complications in the future. Your Lab will be so grateful!